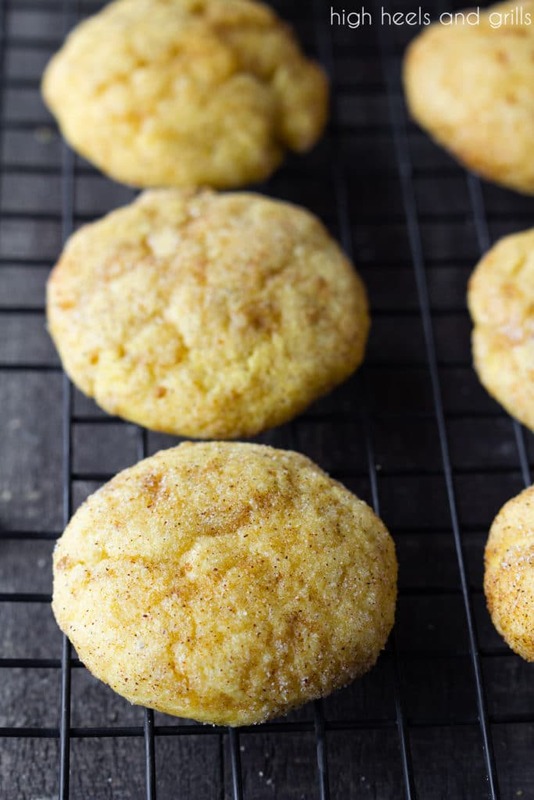 This Pumpkin Snickerdoodles recipe takes everything you love in a snickerdoodle and brings it to the next level by adding a pumpkin pie taste to it! I love snickerdoodles, as is mentioned when I made this best snickerdoodles ever recipe and these snickerdoodle bars. All of that buttery goodness has my heart and takes me back to being a kid, baking in the kitchen with my mama. 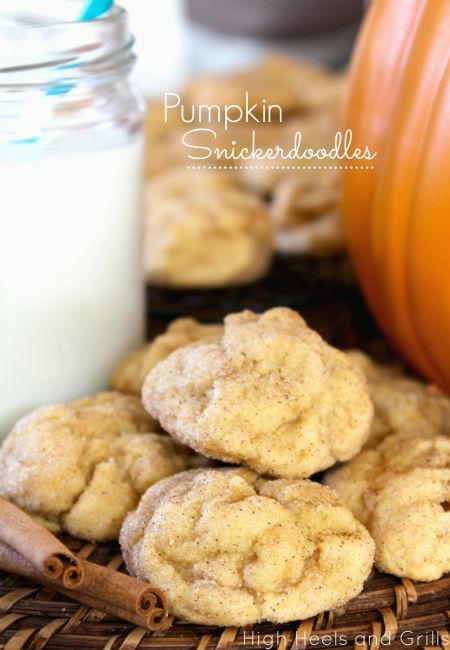 These pumpkin snickerdoodles have taken that love to a whole new level, since I am also a big fan of pumpkin desserts! 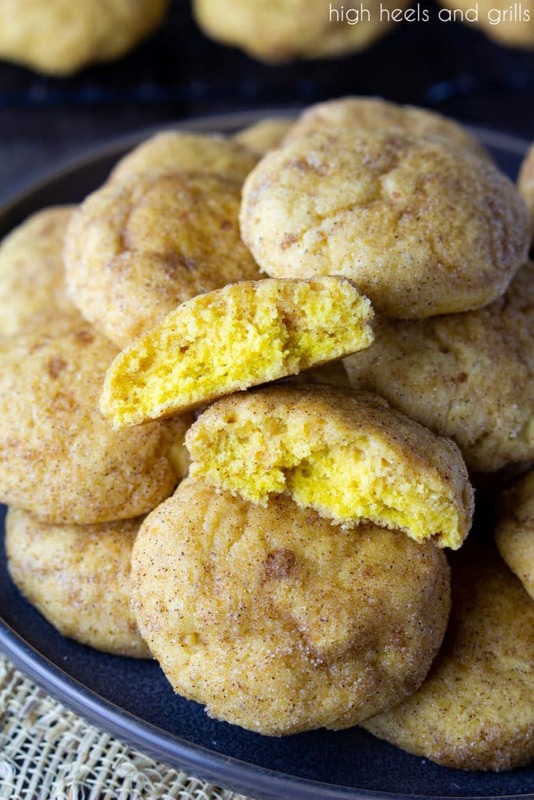 What makes pumpkin snickerdoodles different from regular snickerdoodles? Obviously, I add a little bit of pumpkin puree, but one of the biggest difference is in the spices! Regular snickerdoodles just use a little bit of cinnamon. 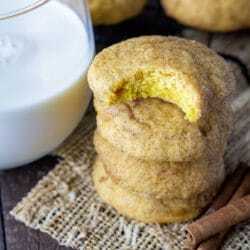 Pumpkin Snickerdoodles use some cinnamon, nutmeg, ginger, and allspice. They taste like a little pumpkin pie in your mouth! What if I don’t like thick Pumpkin Snickerdoodles? You can make the recipe as is, but flatten the dough with the bottom of a cup after it is rolled into a ball and on the cookie sheet. Cut out 3/4 cup of the flour. It’s going to make the dough stickier when trying to get it in the refrigerator, so be sure to use some cooking spray on your hands. Mix the sugars and butter. Add all the wet ingredients, then add all of the dry ingredients. Place the dough in the refrigerator for an hour to let it firm up and become easier to handle. Roll into balls and then dip in the sugar/spice mixture. These are super simple and packed full of flavor! I could eat about a dozen of them without batting an eye. I hope you love these pumpkin snickerdoodles as much as I do! 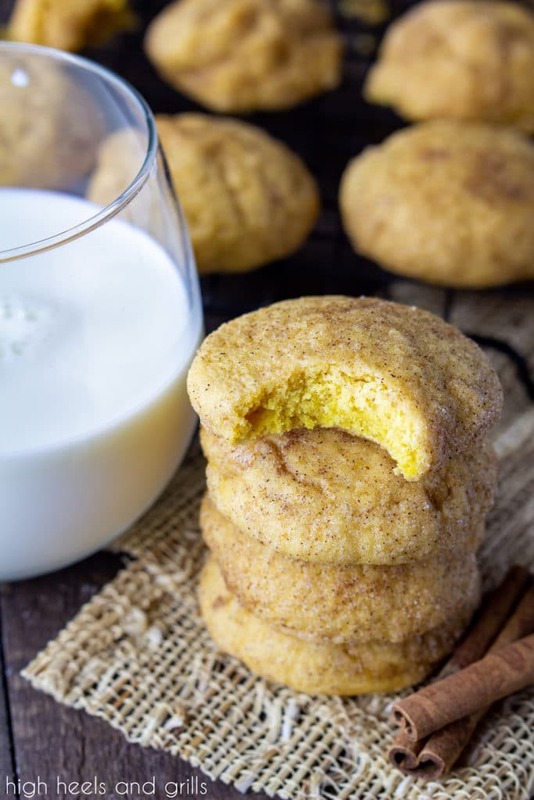 This Pumpkin Snickerdoodles Recipe take everything you love in a snickerdoodle takes it to the next level by adding a pumpkin pie taste to it! In a large bowl, cream together the butter and the sugars until light and fluffy. Beat in the pumpkin and combine well. Add the egg and vanilla extract and mix well. In a medium bowl, combine the flour, baking powder, salt, cinnamon, and nutmeg. Wrap the dough in plastic wrap, flattening to about 2-3 inches thick, and place in the freezer for 30 minutes or the refrigerator for 1 hour. In a small bowl, mix all of ingredients for the sugar coating together. Roll the dough into 1 & 1/2 inch balls, roll them in the sugar mixture, and then place them on a cookie sheet lined with parchment paper or a baking mat. At this point, you can flatten the dough with the bottom of a cup, but I prefer mine to be thick and fluffy. *This recipe was originally posted on September 7, 2013 and is being updated for aesthetic and business purposes. Thank you for your understanding! I love the pumpkin announcement – so true and so funny. And the cookies look yummy. Never tried any Snickerdoodle recipe other than my recipe from my college roommate. That’s been over 40 years…ahem. I just made these and put the dough in the fridge like it says. An hour later I get it out to roll into balls and its so sticky I can’t roll it into a ball. Any suggestions? I just put it back in the fridge hoping in a few more hours it will work. 🙁 I was heartbroken, the dough tasted SOOO yummy!! That’s weird. It might be an altitude thing because we live at 5,000 feet. Maybe try adding more flour? It was super sticky for me until I refrigerated it and then it was fine, so maybe refrigerating it longer would help. We checked it after an hour though and it was fine, so I’m not sure what’s going on! I love snickerdoodles and I love pumpkin. Great combination! Sharing these on my Facebook page tonight!! 🙂 They look awesome! made these without refrigerating and just placing balls of dough into the sugar mixture before baking it and they came out great! thank you so much!!!!!! I’m from the UK, so I’ve never tried a snickerdoodle, but they really look like muffin tops to me!!! I know I’d LOVE them, and especially this gorgeous pumpkin flavor! 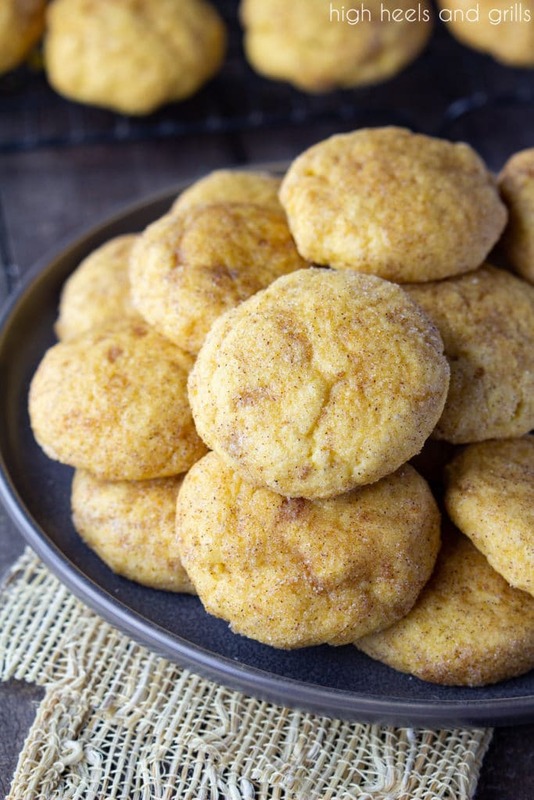 Pumpkin Snickerdoodles are amazing! Love, love, love these cookies!! !